Most people that work from home have a dedicated office space, but for those of you who don’t always work from home and are missing that needed space for the occasional snow day (like here in MD), there are some creative ways to set up an impromptu work space! My favorite solution is probably to convert and armoire or cupboard into a hidden office. Another plus is it helps keep dust off your electronics, and if you don’t have time to tidy up, just shut the doors! Keep a living or library table housed with a lamp and another few office necessities and you can easily use it for an occasional desk. 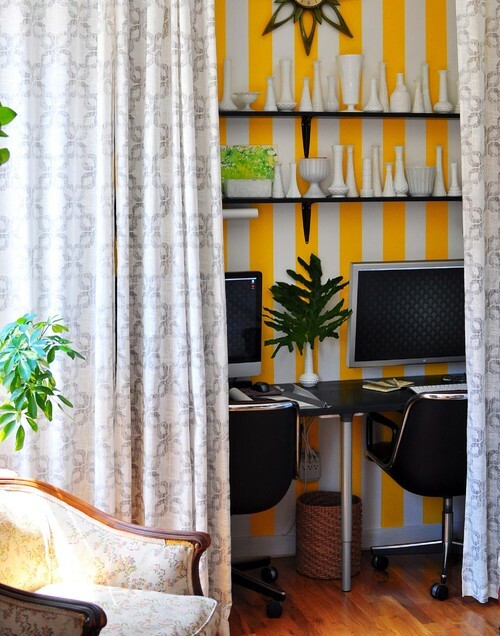 Eclectic Home Office by Austin Interior Designers & Decorators Scheer & Co.
A narrow sliver of room can be dedicated if you work from home for maybe only one day a week, but don’t have a dedicated office. Consider outfitting one wall with a narrow desk. Then, run some attractive draperies far enough out from the wall that it will be able to hide the desk when it’s not in use. If you have room for a rolling table this could be used for multiple purposes. A great work space, extra cooking space, a rolling bar for parties, or portable storage! Clear it off for a day of work from home that won’t affect the rest of your house. Baskets underneath can hold supplies. This hideaway desk is perfect for small spaces. If you are lacking the square footage for an office, purchasing a wall mounted desk could be exactly what you need for those random work from home days. Just pull it down when you need it and store it away when you need your space back!